A sign on the door of the Woody Creek Tavern explaining today's closure. If you’re hankering for a beer and burger at the Woody Creek Tavern today, you’ll have to postpone that craving until Friday. 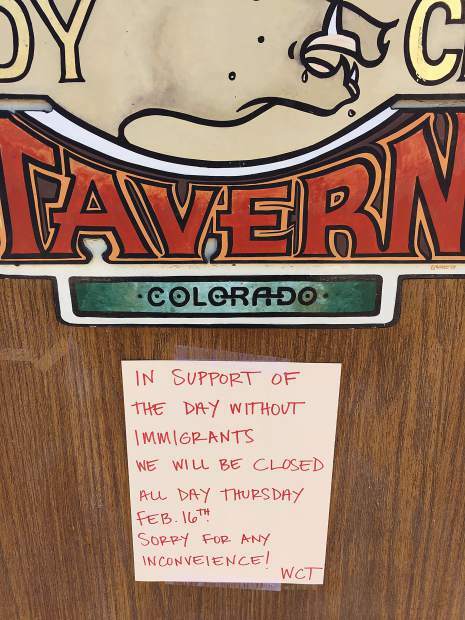 That’s because the tavern’s husband-wife owners decided to close the landmark Aspen-area bar today in solidarity with their immigrant workers for the Day Without Immigrants stance. “If I didn’t do it, I’d be a hypocrite,” said Kevin Willson, the tavern’s co-owner and a former British citizen who’s lived in the Roaring Fork Valley since 1991 and is now a U.S. citizen. Day Without Immigrants is a national boycott in which immigrants pledge not to attend work, open businesses, spend money or send their children to school to demonstrate the effect they have on the country. Willson said it’s not that he’s anti-President Donald Trump. However, he thinks the president’s style of repeatedly insulting people is only going to create enemies. Laura Wren, Willson’s wife, said the couple decided to close today to support their employees. “They’re like family to us,” she said. “We just know how valuable they are to us. Since November 2014, the Obama administration deported people for felony criminal convictions and “significant misdemeanors like DUI,” said Ted Hess, a Glenwood Springs immigration attorney. That meant people in the country illegally who work, abide by the law and simply want a better life for their families were relatively free to pursue those ends, he said. But Trump in January signed executive orders that expanded U.S. Immigration and Customs Enforcement’s focus to people illegally in the country who were previously convicted of crimes (for example, a 20-year-old DUI), those convicted of or charged with any criminal offense, those engaged in any fraud or misrepresentation like buying a fake Social Security card to be able to work, and those who have abused a public benefits program, Hess said. Recent media reports have detailed various ICE raids across the country, though ICE officials have said the majority have been criminals or those who have ignored deportation orders. Still, Hess and others connected to the Roaring Fork Valley’s immigrant community said the federal actions are ramping up the fear factor. Amid that intensifying federal crackdown on illegal immigration, Aspen-area law enforcement officials are again saying they will not participate in random roundups of illegal immigrants. Aspen Police Chief Richard Pryor agreed. Both men said they would hold people for Immigration and Customs Enforcement if a person is the subject of a warrant signed by a judge, especially for violent crimes. But, for example, an illegal immigrant ticketed for driving without a license would not be held, the sheriff said. “That person will never see the inside of my jail,” DiSalvo said. Aspen Mayor Steve Skadron also supports the immigrant community — which he reiterated during the public comment section of Monday’s City Council meeting. And it’s not just a human rights issue, the mayor said, echoing others involved in the debate. A 40-year-old Mexican chef at an Aspen area restaurant, who is in the country illegally but has lived in the valley for 20 years, said Wednesday that Trump has inspired a lot more trepidation in the Hispanic community than President Barack Obama did. He said he’s worried about being deported and what might happen to his two young children if that occurs. He also said he’s worried about interactions with local police. “I’m not a criminal,” said the chef, who requested anonymity. “I don’t sell drugs. I’m here for my family. Samuel Bernal-Urbina, vice president of a media company that runs the La Tricolor Hispanic radio station in Basalt, also said people are more fearful under Trump than Obama. However, he said the uncertainty about what might happen in the near future is the source of that fear. Both Hess and Bernal-Urbina said they’ve heard of no federal raids in the Roaring Fork Valley so far. And, in fact, Bernal-Urbina said he thinks most businesses, police departments and other organizations in the area have been supportive of the immigrant community. But asked if people such as the 40-year-old chef who’s lived a law-abiding life in the valley for 20 years should be nervous about recent immigration-related developments, Hess didn’t hesitate. He said he expects an ICE team that covers Pitkin, Eagle and Garfield counties to soon mount a raid targeting “criminal aliens” and those who have ignored previous deportation orders. He also said he expects to see a push in the near future to “induce” local law enforcement to help immigration enforcement efforts. Furthermore, targeting law-abiding illegal workers is counterproductive, he said. “I’m just beside myself,” Hess said. “As a nation, we’re just insane to have devoted all these resources to interior immigration enforcement when we need these people.